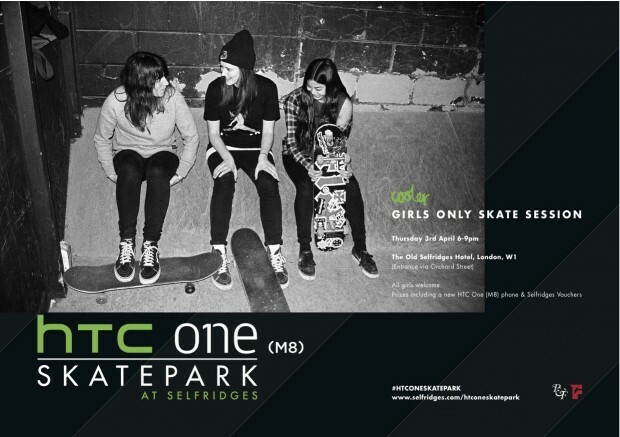 Don’t forget ladies, the GIRLS ONLY skate session at the newly opened HTC One Skatepark at the Selfridges Hotel in London is TOMORROW EVENING from 6pm until 9pm, there will be prizes and free cider! “The night is for ALL GIRLS of ALL AGES and ALL ABILITIES. No RSVP necessary just show up and bring every girl you know! Yes there’ll be pro cats like Lois Pendlebury, Helena Long, Stef Nurding, Jenna Selby, Maria Falbo & more showing us how it’s done. But there will also be girls who’ve never skated in their lives getting tips from the awesome skate instructor Amy Ram, & a bunch of us who haven’t skated properly since we were kids, falling down & laughing a lot. Even if you just want to come down and watch you’re super welcome. AND we have prizes! An HTC One (M8) Phone & Selfridges shopping vouchers, for categories such as best trick, best beginner & more.